SIOR, president of CIBS; Finn; Fiorini; Curry; Bregman; and Yaffe. 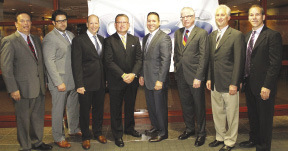 The Commercial Industrial Brokers Society of Long Island (CIBS-LI) hosted its annual fall "State of Long Island Real Estate" event featuring a panel of real estate and business leaders. The program focused on local real estate and economic issues including commercial development, transportation, energy, affordable housing and taxes. Event panelists included David Pennetta, SIOR, executive director, Cushman & Wakefield; John Finn, director of leasing and acquisitions, Damianos Realty Group; Alberto Fiorini, principal, Alliance Real Estate; Richard Yaffe, principal, Triangle Properties; Russel Helbling, VP, Sabre Real Estate; and Paul Bregman, The Bregman Org. Peter Curry, Esq., Partner, Farrell Fritz, acted as moderator. "Leaders from the commercial real estate industry gave a marketplace update. They offered their views on the state of the region's economy and its future. The important topics covered by the expert panelists were well received by the Long Island real estate brokers and the business leader in attendance," said Gary Schacker, SIOR, president of CIBS. Topics covered by the panel included new office construction, the state of class A business office space on Long Island, retail space, particularly in the food service industry, rental pricing, the effect of consumers moving toward Internet-based commerce and recent news coverage regarding vacant office space and scrutiny of local industrial development agencies (IDAs) tax incentives for businesses. Pennetta and Finn believe that the construction of new office space is a positive trend but will not continue without pre-leasing and incentives from local governments. "There aren't going to be buildings built on speculation just yet. Melville and Garden City have seen rent growth in the A class sectors, as a whole, even on an industrial end, rents have been flat," said Pennetta. While assets in our market are "slowly resetting in of value from the highs of 2007," Finn said, interest rates have remained historically low while the rental market has been relatively flat for the past 15 years. Most of the growth for office space will be seen in the medical industry as the independent aspect of private medical practices will be forced to join larger health systems where the individual doctors will become directly employed by the hospitals. Finn projected that within 18 months there will be "a seismic shift in how hospitals do business due to Obamacare." Pennetta added that new players such as Mount Sinai will also try to enter the market and try to take a portion of business from players like North Shore and the Catholic Health Systems. Pennetta and Finn believe that the construction of new office space is a positive trend but will not continue without pre-leasing and incentives from local governments. "There aren't going to be buildings built on speculation just yet. Melville and Garden City have seen rent growth in the A class sectors, as a whole, even on an industrial end, rents have been flat," said Pennetta. While the market is "slowly going towards a resetting of values," Finn said, rates are declining since the rental market has been flat for the past 15 years. Most of the growth for office space will be seen in the medical industry as the independent aspect of hospitals will decline as more systems acquire healthcare facilities. Finn projected that within 18 months there will be "a seismic shift in how hospitals do business due to Obamacare." Pennetta added that new players such as Mount Sinai will also try to enter the market and try to take a portion of business from players like North Shore and the Catholic Health Systems. The retail market will rebound since Helbling sees retailers are still actively growing, specifically citing the "strong trend" in gourmet and specialty hamburger retail locations and fast-casual dining experiences such as Chipotle continuing to make a push into the Long Island marketplace. Other food service franchises looking to expand include Dairy Queen and Stewart's All-American. Playing off this is that fitness brands, specifically offering personalized training facilities, are also on the rise, while the "yogurt fad has died." The Internet is having an effect on the retail industry, causing some businesses to shift from brick-and-mortar to more warehousing locations to fulfil online orders. According to Helbling "I only see soft goods and apparel retail growth in the mall setting." The versatility of spaces should be at the forefront of landlords' minds as renovations can be very expensive after larger box tenants vacate and the space requires reconfiguration to adapt to smaller tenant configurations. Also, sanitary limitations in Suffolk County create a challenge to landlord as certain businesses such as general restaurants, fast-food restaurants or gyms require greater capacities of sanitary usage according to Bregman. Yaffe advised firms to continually market and upgrade their inventory of buildings "to make sure we have a product that can be used by a number of different types of tenants." Regarding IDAs, panelists were overwhelmingly in favor of the actions taken by the entity, but Pennetta believes they are not doing enough, citing stiff competition from neighboring states to lure companies away from Long Island, and should expand beyond their pursuit of manufacturers to other businesses as well. "New Jersey is using them and is huge. They are selling the whole package. Here we're very fragmented. We need to have a unified voice because our competition is doing it." For information about the Commercial Industrial Brokers Society of Long Island visit www.CIBS-LI.org.